Adjusting to living with sight loss isn’t easy and one of the most difficult challenges are the misconceptions. Since the prevailing societal notion is blindness means total darkness, sighted people can understandably be confused about what it means to be blind. Truth is, the range of blindness or sight loss is enormous and it differs from person to person. Many people who are blind or visually impaired rely on a white cane or guide dog to navigate the world safely. There are also many blind people who do not use a cane or a guide dog. Since I was born with sight and later lost it, I can look directly at you, however, I am not ‘seeing’ you. Depending on factors like lighting what I can ‘see’ is a shape of a person and some clothing color. I cannot see your face or facial expressions. If you’re across a room I don’t know who you are unless you tell me. For another person, what they ‘see’ or cannot ‘see’ even if we have the same condition will be different. A gray, teal and white boldblindbeauty.com template uses the ‘Abby’s Corner’ image. Abby is sitting cross-legged in her PJs (gray bottoms & white top with a gray collar). She is using her teal Abby logoed laptop with a headset with microphone. Sporting her signature explosive hairstyle, her white cane is propped up next to her. Thank you Anna! It sure can be complicated how to explain so that other’s who’ve never experience it might better understand. I find myself not understanding it and I’m going through it. Hello Steph. How are you? it’s been a while since I stopped by. I found this post so interesting. As you know i am ‘deaf’ in my left ear. As with sight loss, there are different types of hearing loss. I do actually have just under 10 percent of hearing in my left ear in some frequencies. however, this doen’t mean i can hear. occasionally if there is a high pitched loud noise, i might feel the vibration in my left ear…but this is all. Having unilateral hearing is different to having some hearing loss in both ears. With some hearing loss in both ears, people can locate the direction of sound – this is something two ears do…With my one working ear, I cannot…There are so many degrees of ‘deafness’, just like you wrote about sight loss. It’s great you are writing these posts to help people understand a little more about living with sight loss..With these issues, it is very difficult for people to ‘imagine’ unless it is first explained/described to them. Anyway, i hope you are well. Hi Carly!! How are you? Oh wow it’s been so long since I’ve stopped by your place. My old laptop died and with it went my browser folder of favorite blogs. I use the reader but I like to keep a folder of people like you who I’ve connected with so I don’t lose touch. Thank you for commenting here. I’ve learned so much from your experience with hearing loss. I have a few friends who have hearing and sight loss which is another demension one couldn’t understand unless they’ve gone through it. Hello. I’m good thank you 🙂 yes, I’ve learned so much from you too! You are right…I cannot start to imagine a sight loss with hearing loss…I bet these friends of yours have some very interesting stories to tell. Yes, some of us have talked at great length about combined blindness and hearing loss and how it impacts their ability to feel included. Interacting with some of them has reminded me to be patient, something I think we run too short on these days. This is an interesting column and blog. The glaucoma has had its impact, right on the the genetic schedule, and being diagnosed as legally blind is only the culmination of a long process. I wonder though why a blog on blindness is written in small fonts with minimal contrast – some how that’s counter intuitive. Norway maintains standards for visibility for persons with disabilities, and I wonder if there is any similar guidelines in America? Thank you for your comment Roger. I just read an article on Norway’s accessibility standards the other day and it would be great if all countries operated on the same level. This would make life so much easier for everyone. Regarding this site, I am looking to add an accessibility team however in the interim most of my blind and visually impaired users (myself included) use software on our devices to navigate the site. I would love to be able to do this myself however I am not a web or accessibility expert and am learning on the fly. The site continues to evolve and because part of our mission is connecting sighted and non-sighted people it needs to be accessible and also aesthetically pleasing. 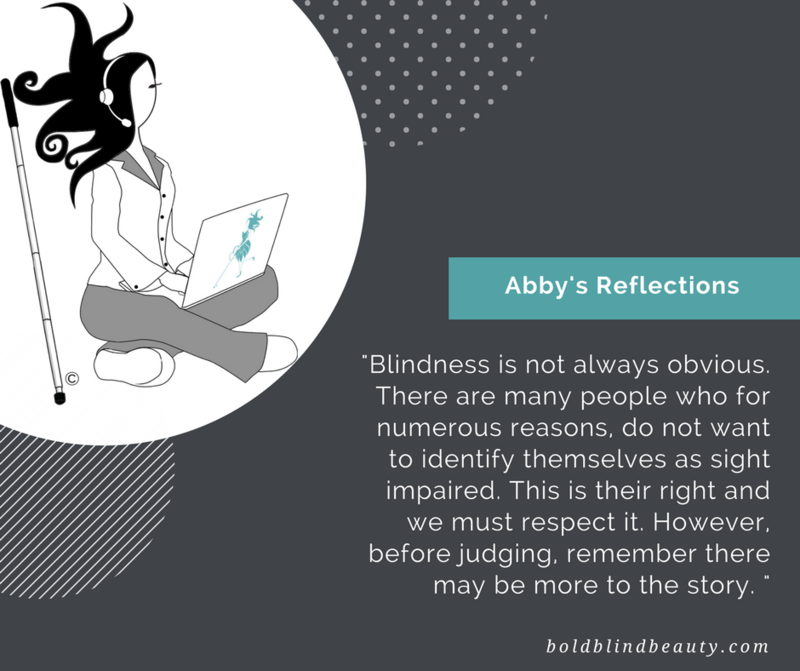 Thank you for addressing misconceptions about blindness. I have learnt a lot too by going regularly for shiatsu by blind men trained by a Japanese master. Watching them move and navigate it is clear there are differing amounts and quality of vision from one to another. Hi Peta, how are you my friend? I’ve not had an opportunity to experience shiatsu however I’m adding it to my bucket list. It’s only been in recent years that I had my first professional massage and it was so relaxing. Thank you for this post Steph. You give us vision in your words in helping us understand. Beautiful. Thank you George. This is one of those topics where I’m constantly trying to think of more concrete ways to get the idea across for people to understand.